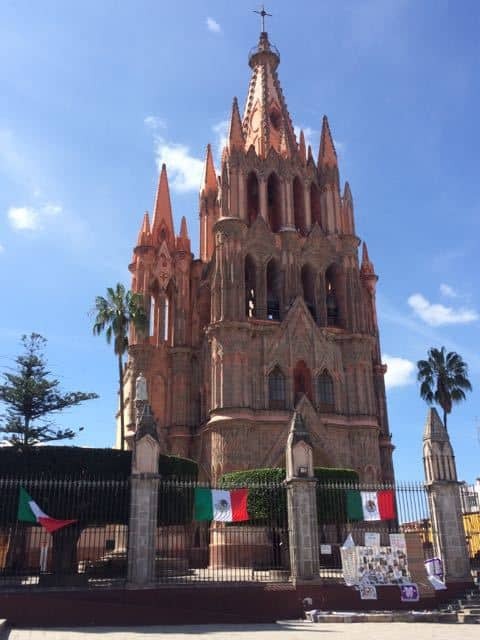 Our September jaunt through Mexico led us from Lake Chapala to San Miguel de Allende. I’d heard so much about San Miguel, and friends from Guatemala were staying there for several months. We rented the apartment downstairs from them for a week. 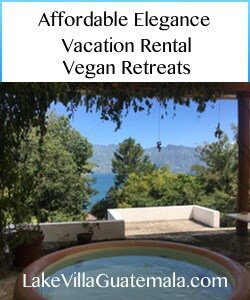 It was perfectly located, in easy walking distance to the center of town and many restaurants promising vegan options. From San Miguel we took a day trip to Guanajato. It’s an easy bus ride and an interesting place to visit. I’d go back and explore there before I’d go back to San Miguel. In between museum visits, we stopped for lunch at Escarola, the only all-vegan eatery I’ve tried in Mexico outside of Mexico City. Though the food was good, the portions were small. Even though it’s vegan, it’s hard for me to recommend a place where you have to order two lunches to not leave hungry. Here is my list of places we tried in San Miguel, going from favorite to least favorite. These are summaries, and you can find my full reviews on TripAdvisor. This Lebanese restaurant is a bit lacking in atmosphere but serves excellent food. The owner understands vegan, the service was good, and everything was fresh and delicious. It’s standard Middle Eastern fare done well. Recommended. After several less-than-inspired meals in Lake Chapala, it was a delight to come to San Miguel and find Chao Ban. We shared the Thai Soup, Vietnamese Summer Rolls, and two appetizers: peanut noodles and pita bread with hummus and tofu. The soup was outstanding and everything else was very good. The dining room downstairs is tiny, but it’s a nice space. Zandunga isn’t a restaurant: it’s a food and music experience. This venue, created by guitarist Gil Gutierrez and his wife Rebecca, is in a beautiful setting out in the county. You buy tickets in advance in town (they do sell out, so get tickets early). We took a taxi out to the venue, which feels almost like you plopped a Napa Valley winery down in the middle of Mexico. I talked to Rebecca when I bought the tickets, and she assured me there would be plenty of vegan food options. There were, and I happily stuffed myself while listening to outstanding Cuban jazz. The experience was a highlight of our entire trip. We walked past Dana at the Market twice without ever seeing it, even though we were looking for it: the sign is tiny. The inside is modern and feels a bit industrial. They have several vegan options on the menu. We had an outstanding salad, panini, and herbed fries. Everything was great the the price was very reasonable. We came here with friends who love the family and the food. They have an entire page of vegetarian options, many of which were vegan. While the food was not memorable, the portions were large and well-priced, and the people were delightful. We stopped here for lunch when Chao Ban was closed. The soup and salad lunch was good, though they put cheese on my sandwich when I specifically asked them to leave it off. The real highlight here was the bread. We returned several times to buy more. We came here for the music. The only vegan option was a salad: it was good, but not worth the price. I’d come back for the music, but not the food. We had just arrived in San Miguel and were quite hungry. We ended up here with friends. The seating on the terrace was nice. The waiter looked a bit skeptical when we asked for our salad and pasta to be made vegan. The salad and pasta were fine but nothing to write home about. The price was on the high side for what we got. I wouldn’t go back.